I’m determined not to put the heating on until October but this autumn weather is certainly trying my resolve (hailstones anyone?!) So, it’s ridiculous Nordic cardigans, hot water bottles and comfort food all the way here. Rocket, lettuce and radishes have all fallen by the wayside in favour of starchy root vegetables and soups have kicked out salads. I first came across Cheese and Beer Soup in Kirstin Jackson’s exploration of American cheese, It’s Not You, It’s Brie. It sounded very British – beer, cheese, together in a bowl – so I was surprised to find that it’s a classic American dish that hails from Wisconsin, the dairy capital of the States. There didn’t seem to be any trace of it here at all and it seemed like we were missing a trick. 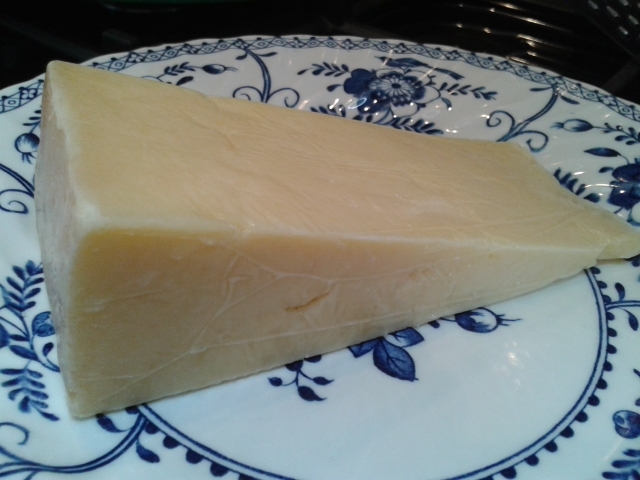 It’s a lovely cheese, less earthy than the Montgomery’s but tangy and fruity. I paired it with a light ale for this soup; don’t try a stout or anything too bitter, as you don’t want it to overwhelm the cheese and vegetables. It would also work well with a decent Caerphilly, Cheshire or Lancashire. There’s lot of different ways to make this soup – others use celeriac or chillies and some make a roux for the base or add cream. I’ve kept it simple, apart from the smoked bacon bits. 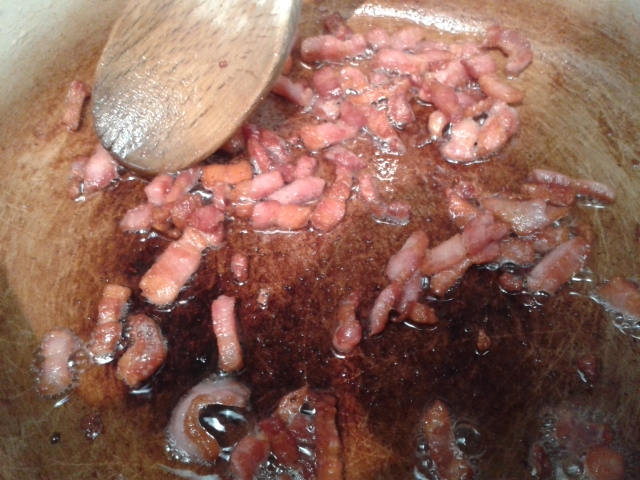 Fry the bacon in a heavy-based pan or casserole dish until it’s nice and crispy (this might take a while but stick with it). When it’s all crispy and lovely and threatening the base of your pan, remove it and put it into a bowl, leaving as much of the fat behind as you can. Add a splash of olive oil to the pan and sauté the onion, carrot, celery and leek gently for about ten minutes until they are soft. Deglaze the pan with a splash of the beer and then add the potatoes, stock, the rest of the beer and the herbs. Cook for about 30 minutes, until the potatoes mash easily against the side of the pan. 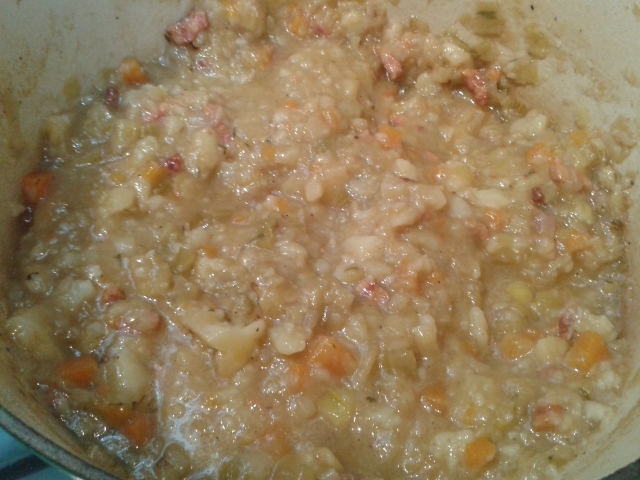 If you like a smooth soup, you can liquidize it at this point but I like it chunky and didn’t want to blitz away my bacon bits so just mashed it up with a potato masher. Keep the soup on the heat and add the grated cheese. It will look like a lot of cheese; that’s because it is. Stir it all in until melted, warm through thoroughly and serve with crusty bread or, if you’re looking for cheese and beer overkill, with some Olde Sussex Cheese and Beer Bread. Perfect autumn comfort food. 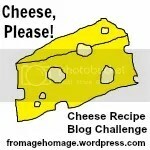 I’m adding this recipe to this month’s Cheese, Please! Challenge which features Cheddar. Because of the autumnal feel to it, I’m also entering it into this month’s Four Season’s Food Challenge. Ahem, reblogged an intro. Never heard of beer soup, sounds great. Tastes good (and I’m not the world’s biggest beer fan). An American classic, transformed with a jolly good British cheese! Lovely. Funny, I’d never heard of it before. 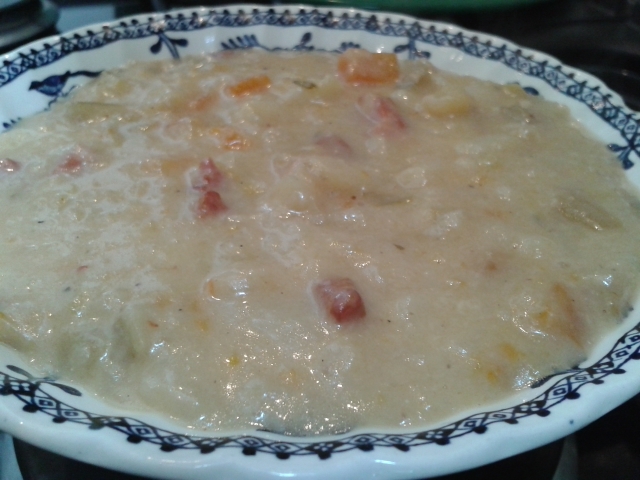 Can’t believe the British missed the opportunity to jazz up leek and potato soup with cheese and beer! YES – we do have some delicious beer cheese soup in Wisconsin! Glad you found this tasty recipe with a British Cheddar.